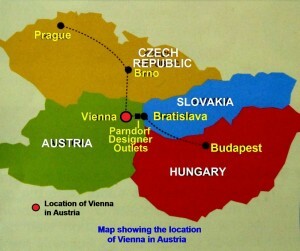 Day 4 of our Eastern Europe tour would be a very busy day for us as we had many historic landmarks in Vienna to visit. Before we started the city tour, an Austrian guide, Michael, met us at the hotel, Hotel Exe Vienna, where we were staying. 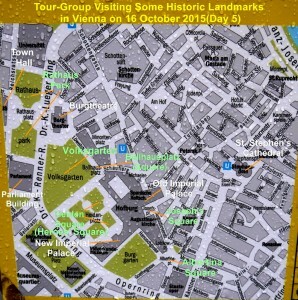 He then brought us to the following historic landmarks in Vienna City. 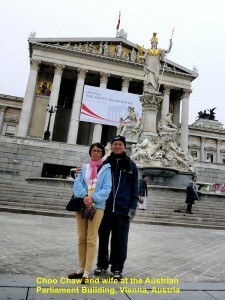 At 9 in the morning, we left our Hotel exe Vienna where we stayed the previous night and went to Town Hall(Rathaus), our first historic landmark visit, in the Old Town. 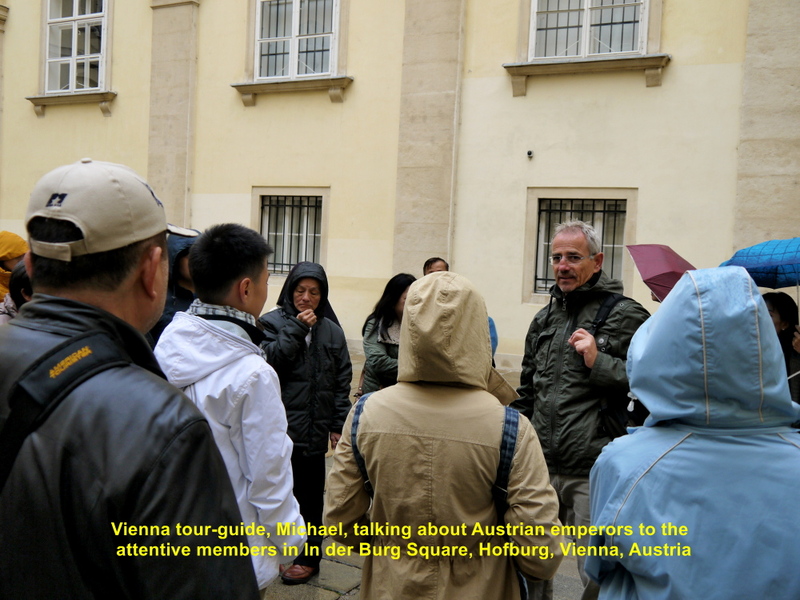 At Town Hall we met our Austrian guide, Michael, who would lead us on the city tour of Vienna. 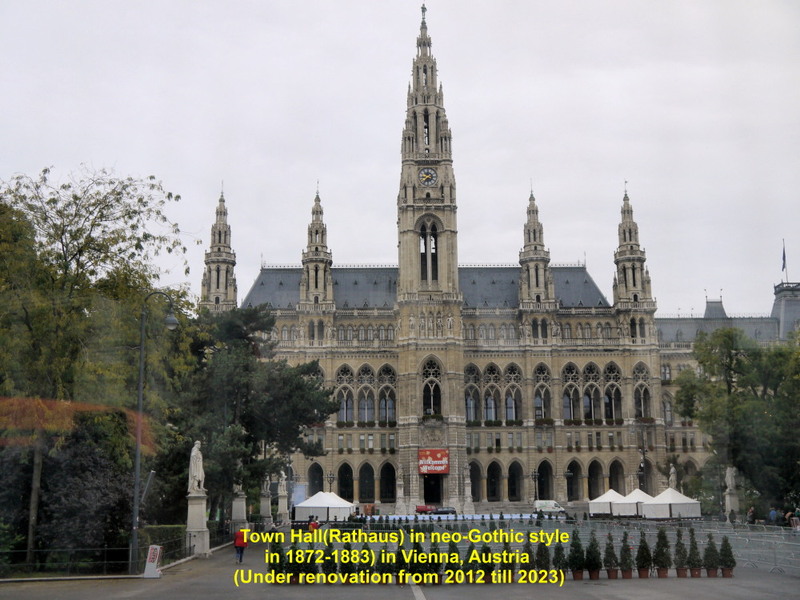 Town Hall was built in 1872-1883 in neo-Gothic architectural style. 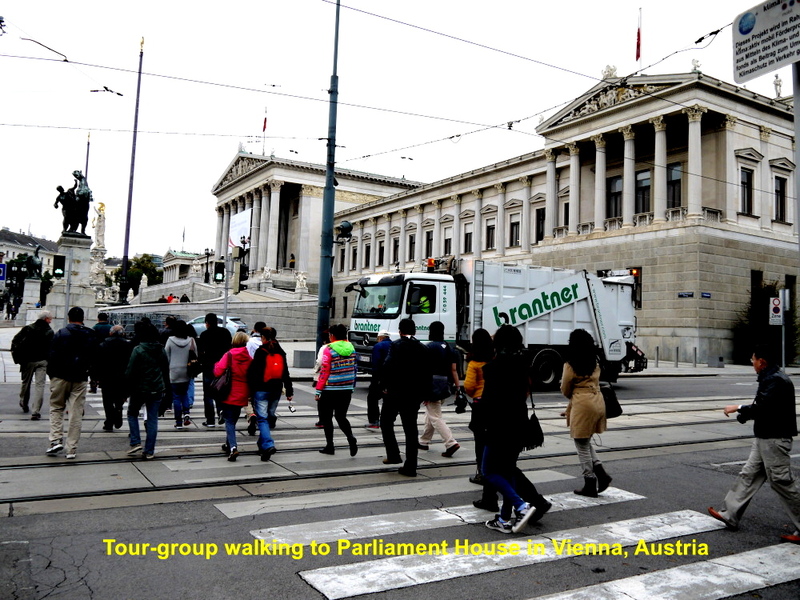 It houses the mayor’s office, city council of Vienna, Governor’s office and State Assembly of Vienna. 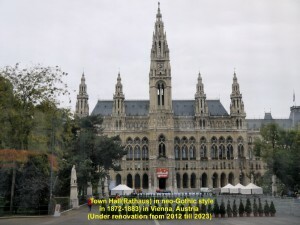 It has been under renovation since 2012 and is expected to be done in 2023. 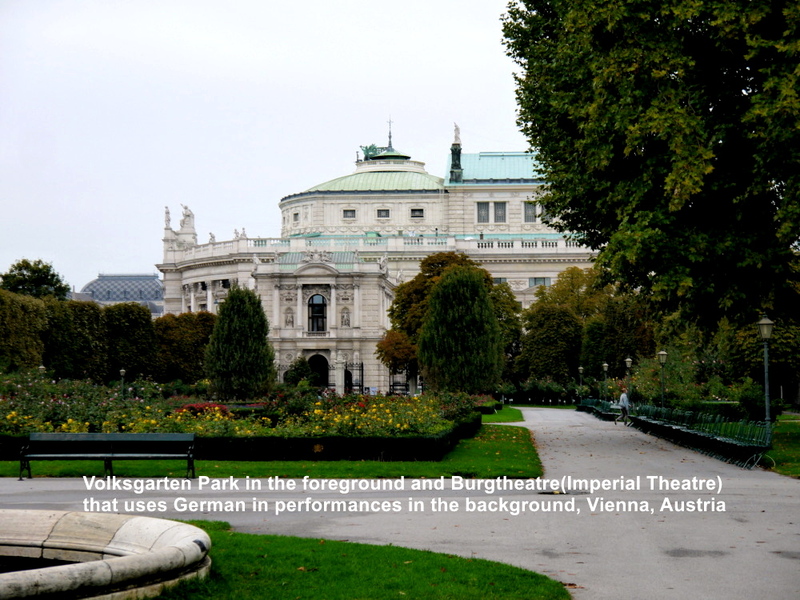 Near Town Hall is a theatre, Burgtheatre or Imperial Theatre, that uses German in performances. 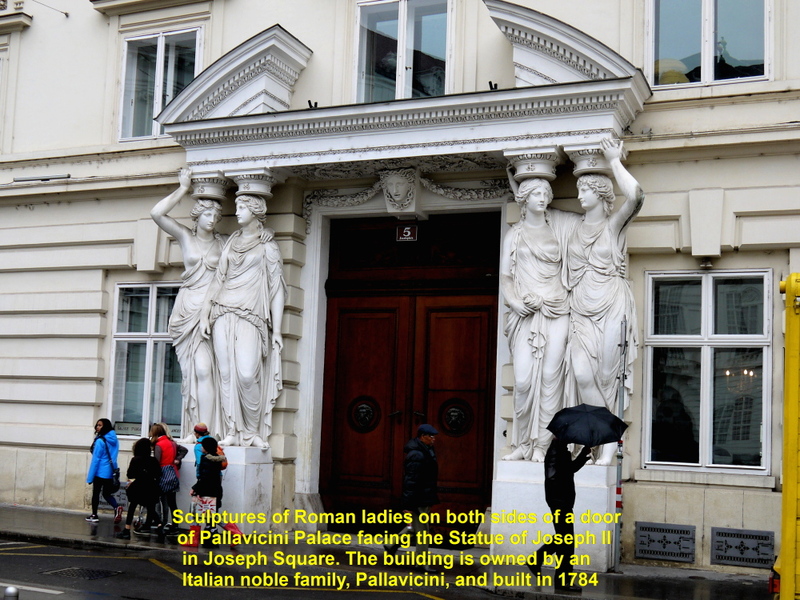 Built in 1741 in Italian high Renaissance architectural style, it has statues and busts adorning its facade. 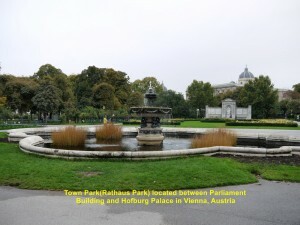 Having seen Town Hall and Burgtheatre, we crossed the town park, Rathaus Park, to the Austrian Parliament Building. The Parliament Building is on Ring Road Boulevard. 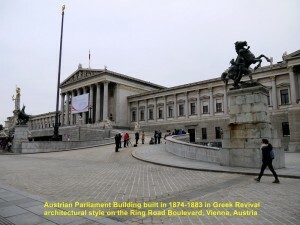 It was built in 1874-1883 in Greek Revival architectural style. 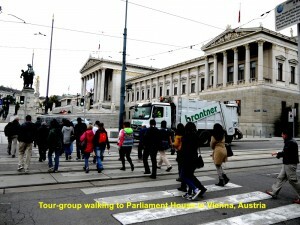 Two houses of the Austrian legislature, National Council and Federal Council conduct their sessions in the building. 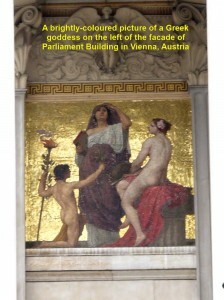 The front of the Parliament Building is decorated with many statues which are mostly Greek figures. But the most beautiful and prominent structure erected between 1893 and 1902 is in front of the Parliament Building. It is a large fountain known as Athena Fountain. 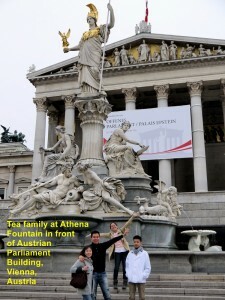 It consists of a statue of Goddess of Wisdom, Athena, standing on top of a tall pillar. She is dressed in armour with gilded helmet, her left hand carries a spear and right hand a small statue of the winged Goddess of Victory, Nike. 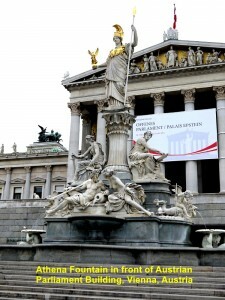 Lying at the foot of the fountain are four figures representing the four important rivers in Austria: Danube, Inn, Elbe and Vitava. 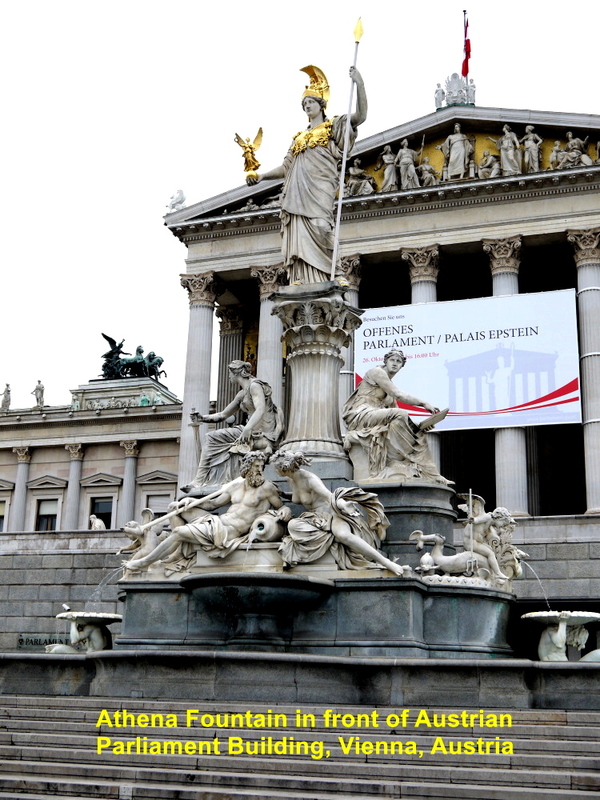 The female figures represent the legislative and executive powers of the government. There is a brightly-coloured picture of a Greek goddess on the left side of the facade of the Parliament Building. 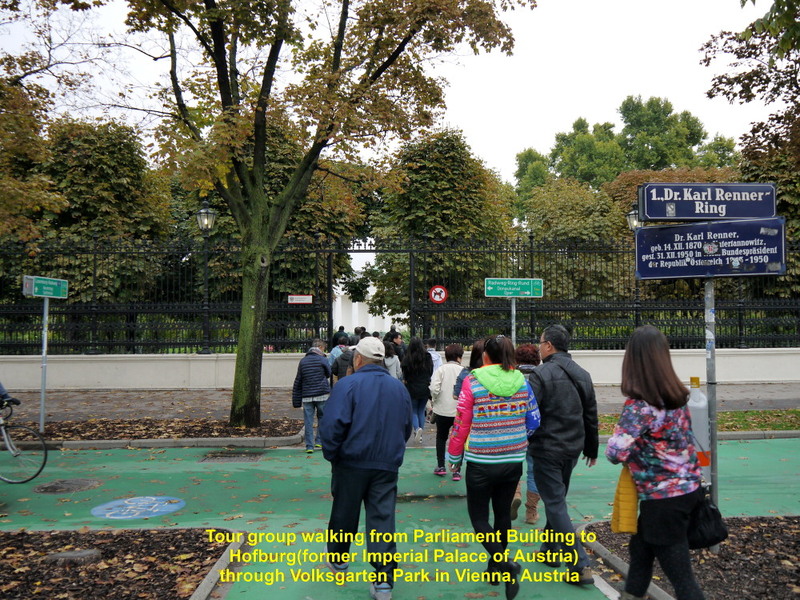 Then we left the Parliament Building and walked to a former royal garden, Volksgarten Park. In this garden there are many varieties of roses, two fountains and some statues of famous Austrian people. A marble statue of Franz Grillparzer was erected in 1889 in memory of him as a poet and playwright. 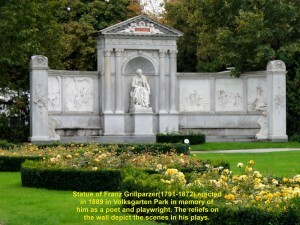 The reliefs on the wall depict some of the scenes in his plays. 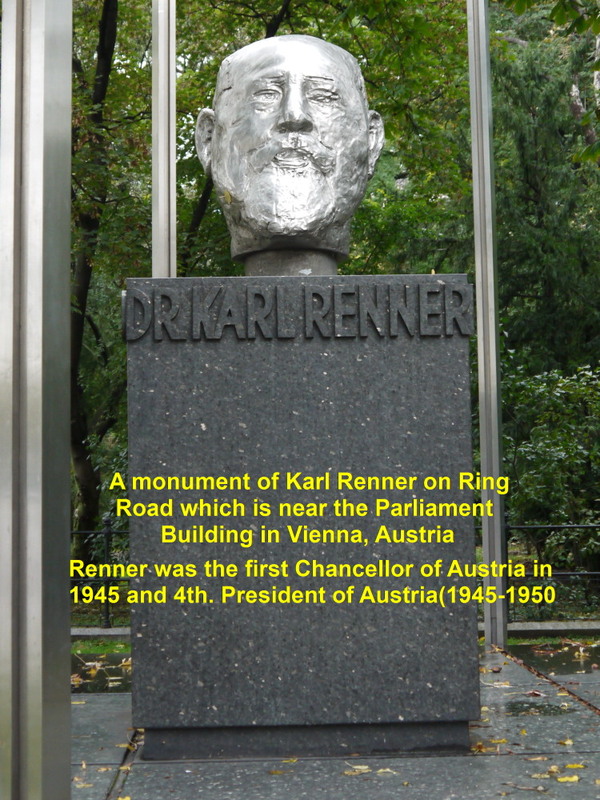 Near this statue is a silver-coloured sculpture of Karl Renner’s head. 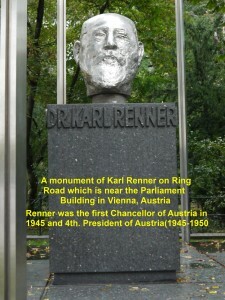 Renner is remembered as the 1st. Chancellor of Austria in 1945 and 4th. 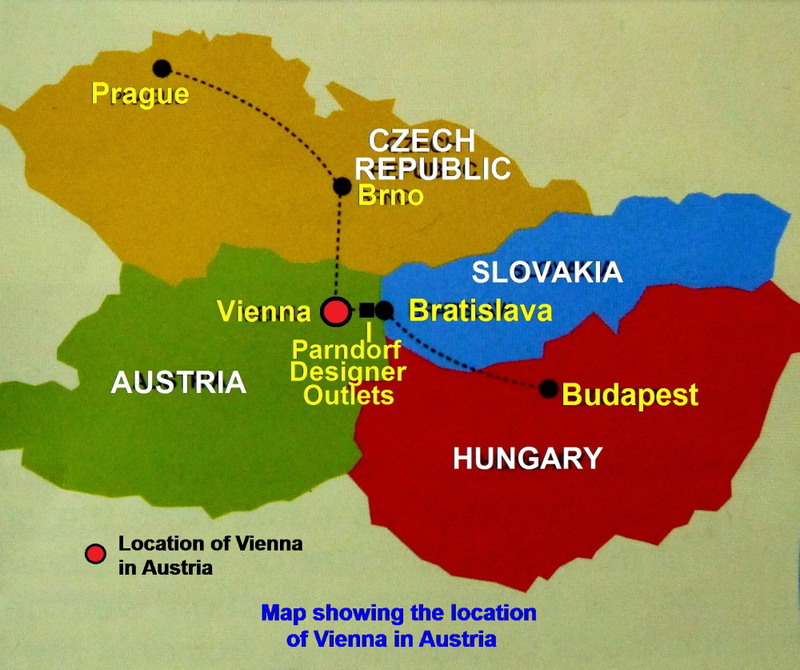 President of Austria from 1945 till 1950. 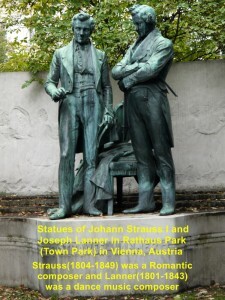 On another spot of the park there are two bronze statues of Johann Strauss I and Joseph Lanner. 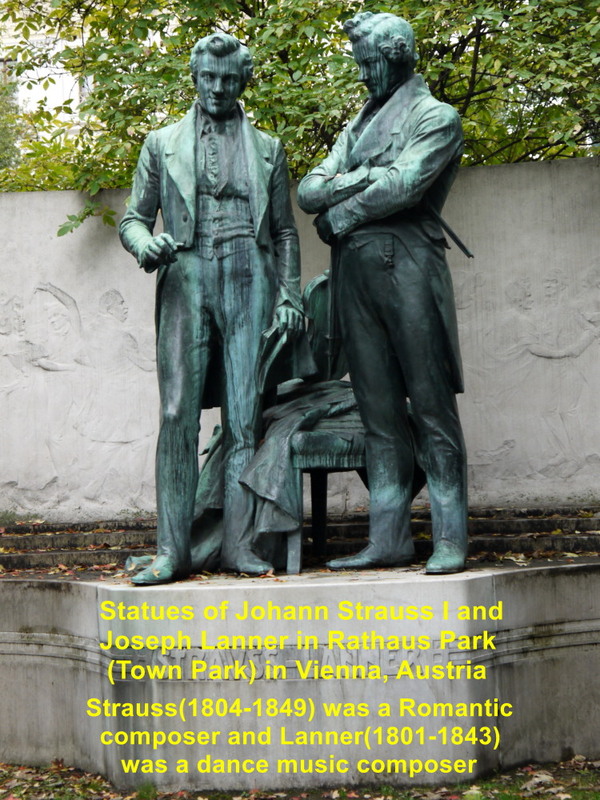 Strauss(1804-1849) is remembered as a romantic composer whereas Lanner(1801-1843) a dance music composer. While walking from Volksgarten to Ballhausplatz(a small square), we saw the large Austrian Imperial Palace or Hofburg a few hundreds metres away. 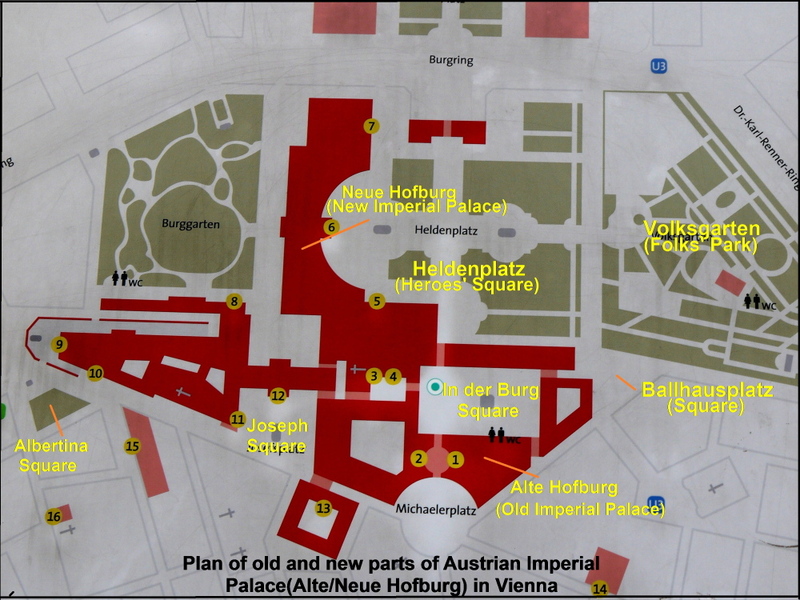 It consists of two parts: New Austrian Imperial Palace(Neue Hofburg) and Old Imperial Palace(Alte Hofburg). 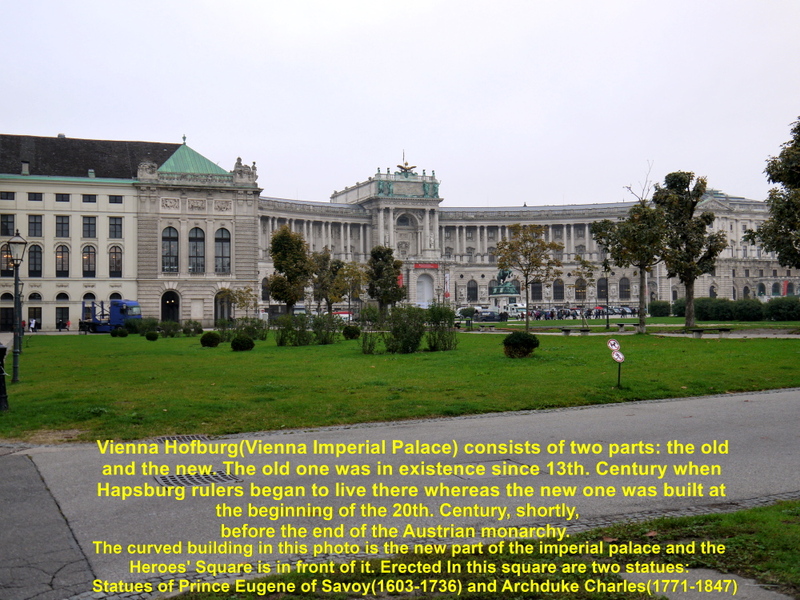 The New Imperial Palace(Neue Hofburg) is a long, curved, majestic-looking building, and was built at the beginning of the 20th. Century, shortly before the end of the Austrian monarchy in 1918. 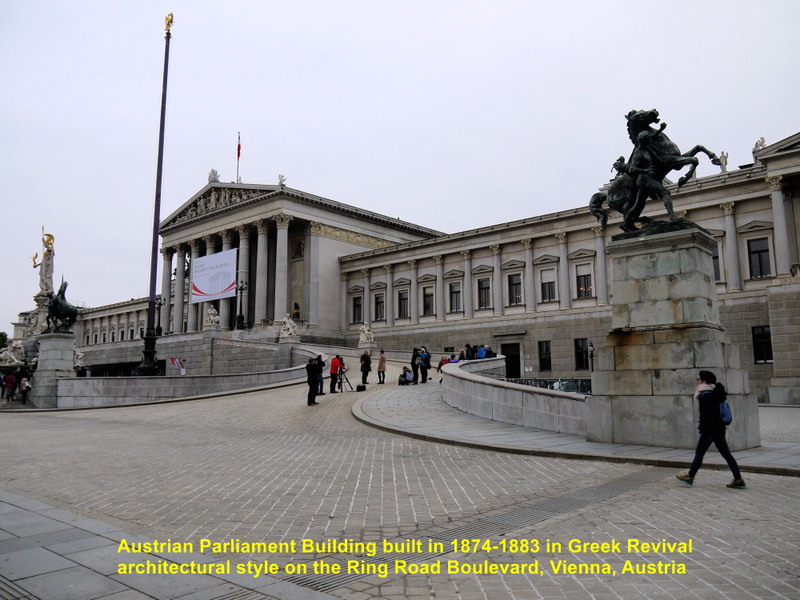 It now houses Austrian National Library, and a few museums including Ethnology, Papyrus, Ephesos, Arms and Armour, and Ancient Musical Instruments. 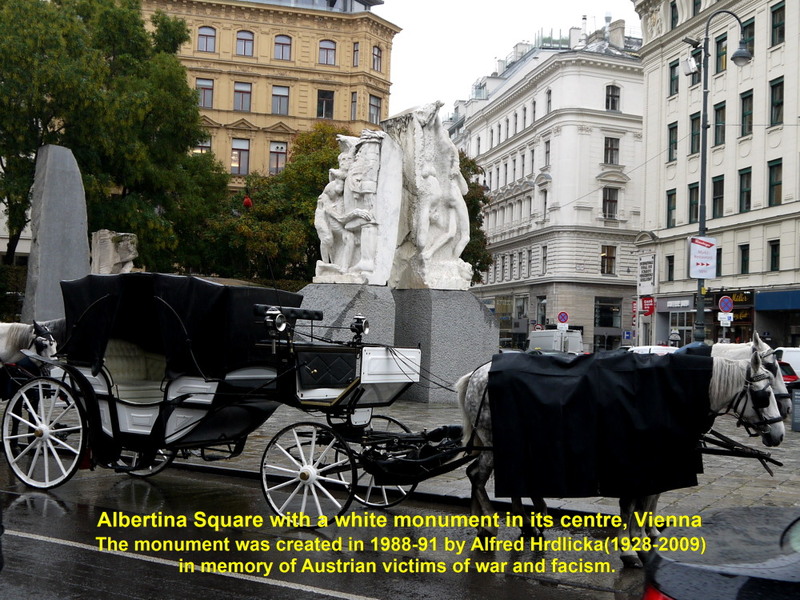 There are two equestrian statues in a large open space, Heroes’ Square(Heldenplatz), in front of it. One is the statue of Prince Eugene of Savoy(1663-1736) and the other Archduke Charles(1771-1847). Prince Eugene was a great military commander of the Imperial Army who had fought in many battles and wars, including Great Turkish War, Nine Years’ War, War of the Spanish Succession, Austro-Turkish War and War of the Polish Succession. 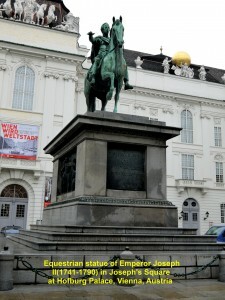 Archduke Charles was also a great military commander and reformer of the Imperial Army. 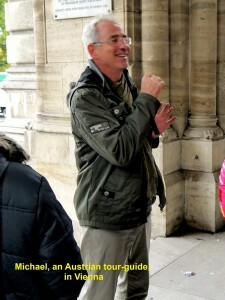 He was considered as a hero of the French Revolutionary and Napoleonic Wars. 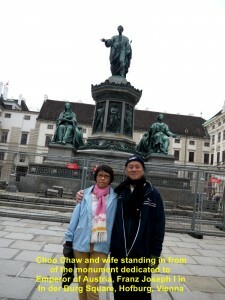 Before we visited the Old Imperial Palace, we walked to a small square, Ballhausplatz. A war memorial was erected in 2014 in this square. 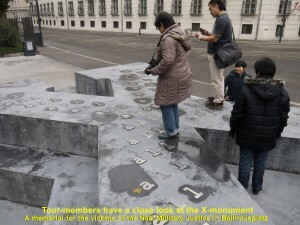 It is a large three layered concrete structure in the shape of letter “X”. 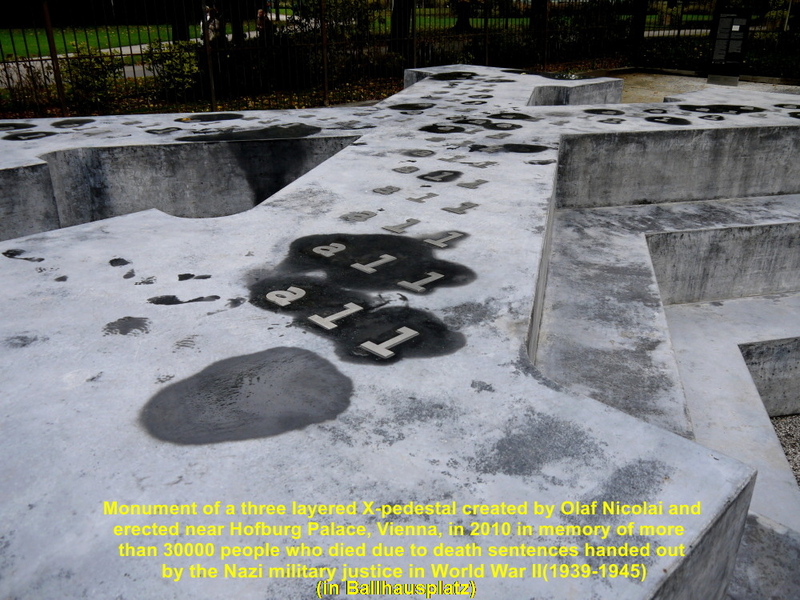 It is to remember more than 30 000 civilians, soldiers and prisoners-of-war in Europe who received death sentences from the Nazi Military Justice during World War II(1939-1945). 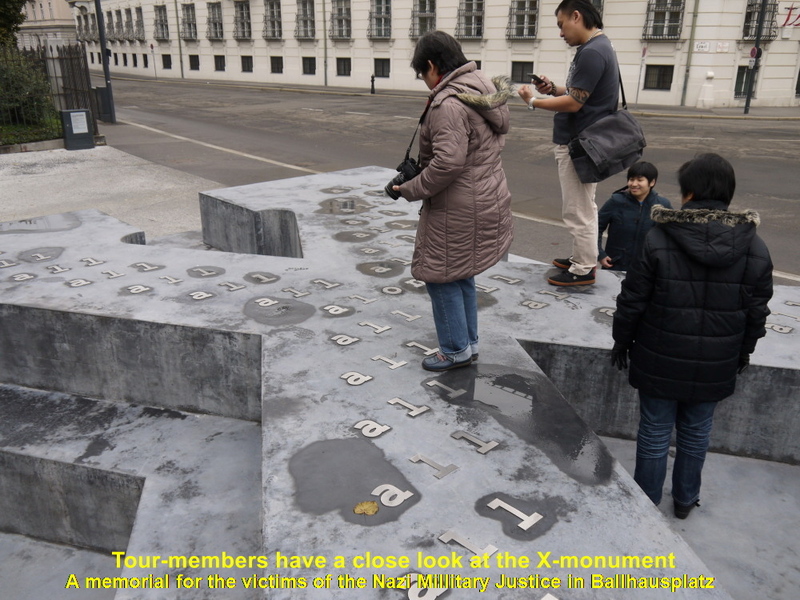 The “X” refers to the victims who were considered as “subverters of the war effort” by the Nazi military courts. 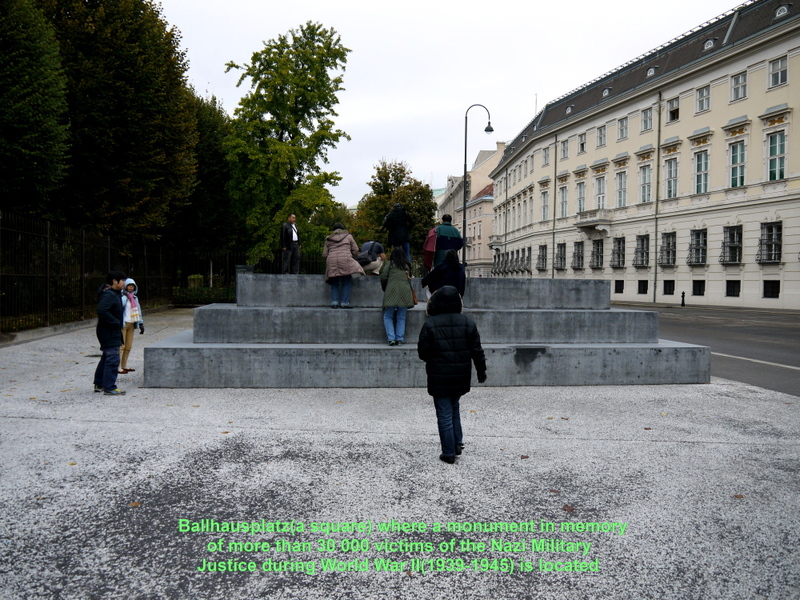 On top of the X-monument are just two inscribed words: “all” which is repeated many times and “alone” just once in the centre of “X”. These two words are found in one of Ian Hamilton Finlay’s poems. 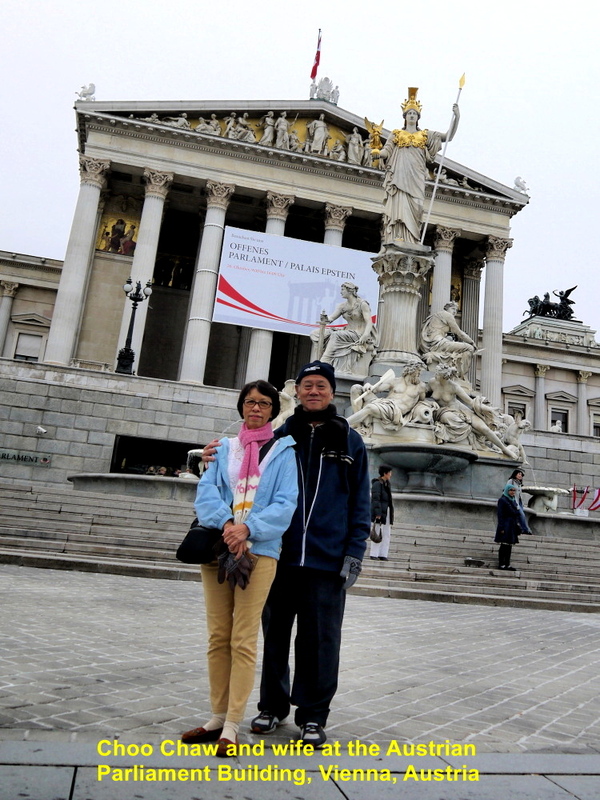 Having spent several minutes at the war memorial in Ballhausplatz Square, we walked a few metres to the Old Austrian Imperial Palace (Alte Hofburg) adjacent to the new one. 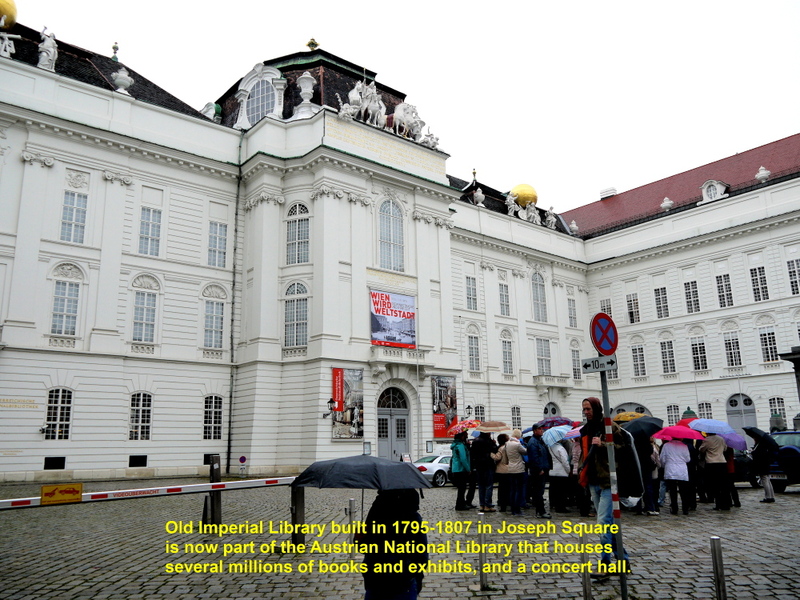 This old palace had been the residence of Austrian rulers, kings and emperors for over 600 years from the 13th. Century till the end of the monarchy in 1918. 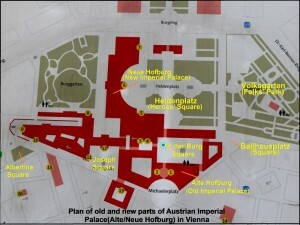 The main part of the old palace has a courtyard, In der Burg Square, which is surrounded by four building blocks. 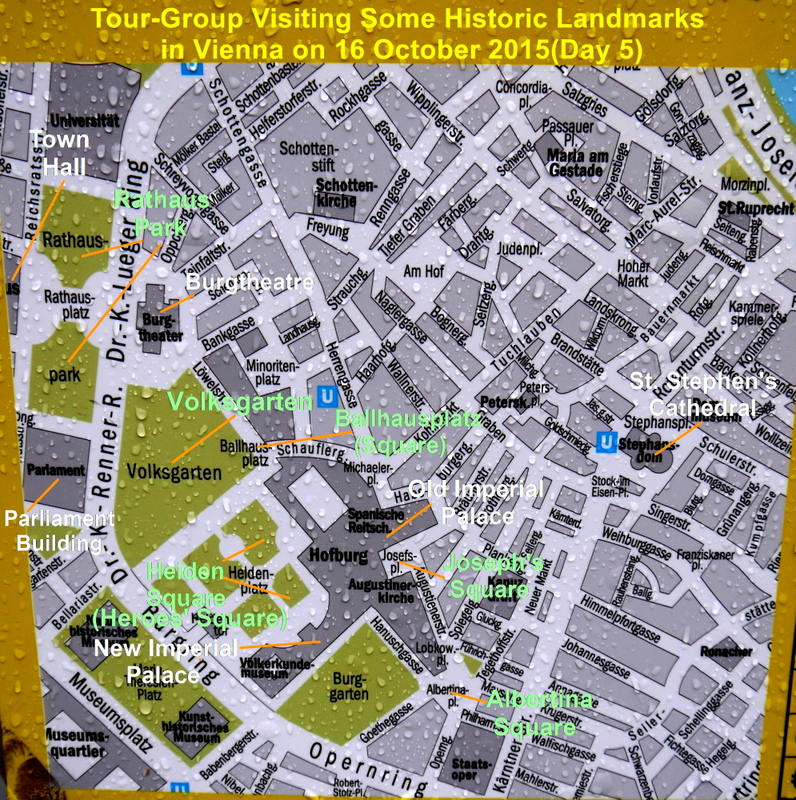 The oldest block was originally a fortress, Old Fortress(Alte Burg), built in the 13th. Century. It is now known as Swiss Wing. In the 18th. 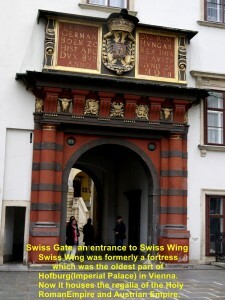 Century, the Old Fortress was known as Swiss Wing when Swiss guards were employed to guard the palace. The fortress had undergone a lot of changes. 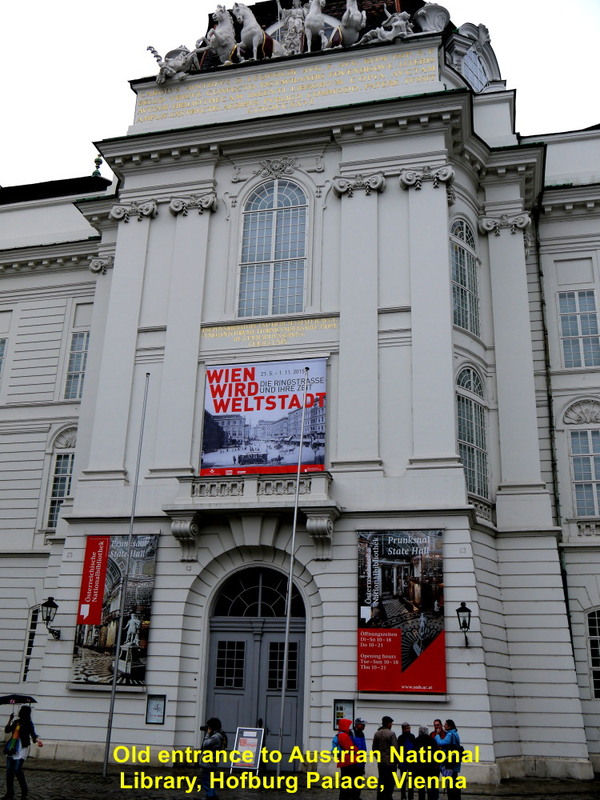 Swiss Wing now houses the Imperial Treasury of the regalia of the Holy Roman Empire and the Austrian Empire. 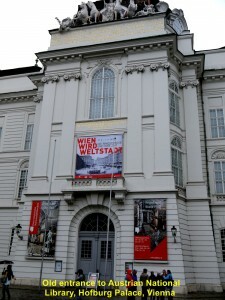 The entrance of Swiss Wing called Swiss Gate(Schweizertor) looks attractive with red and black paints, and an imperial emblem. 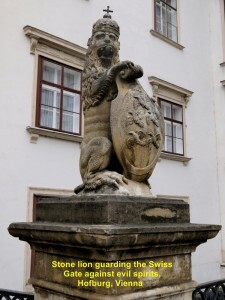 Besides, there are two stone lions guarding the entrance against evil spirits. 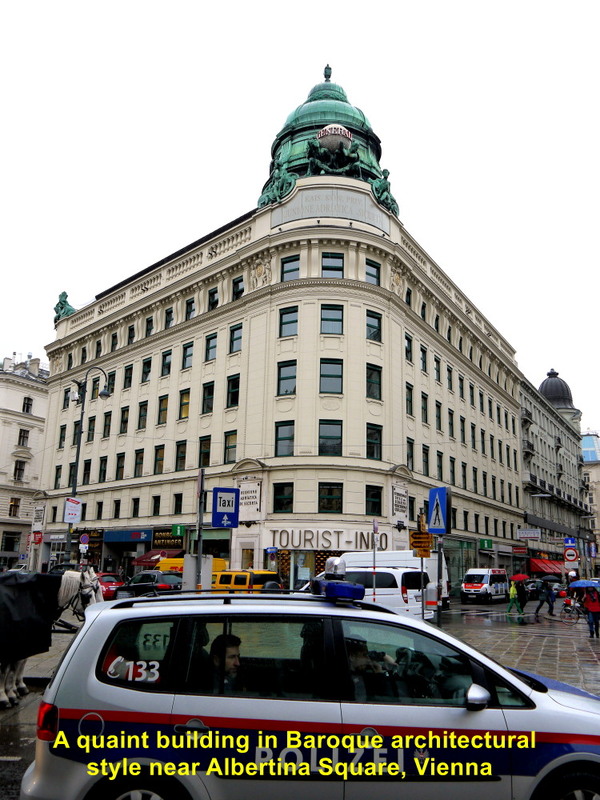 The building opposite Swiss Wing is Amalia Residence(Amalienburg) which was erected in the 16th. Century. 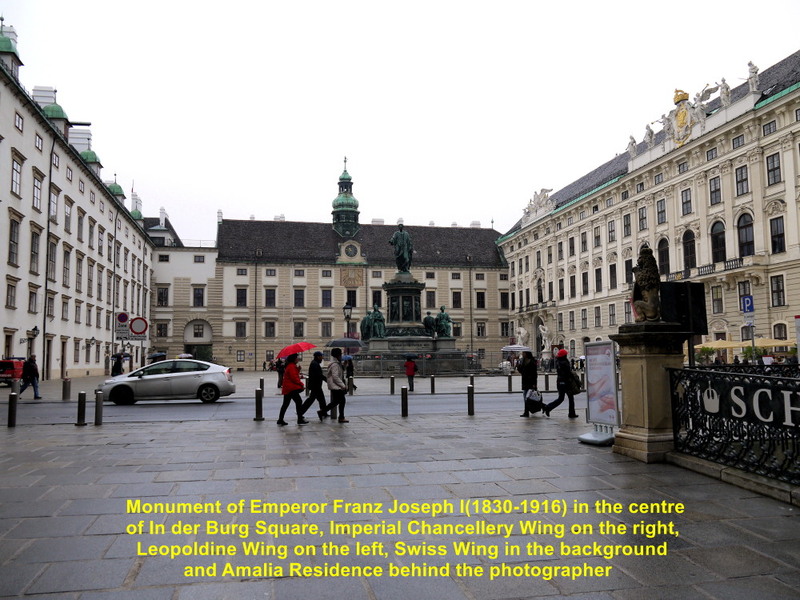 It was Empress Amalia’s residence, after her husband, Emperor Joseph I(1699-1711) passed away. 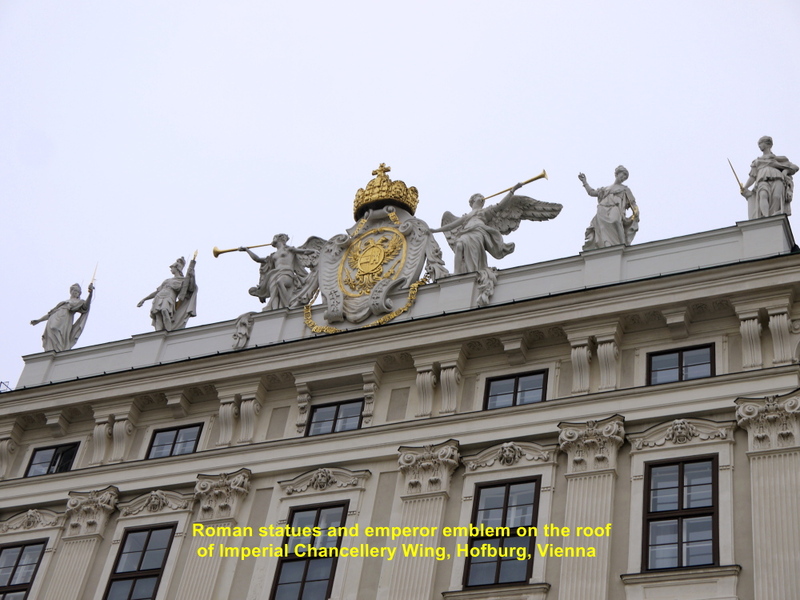 Empress was born in 1673 and died in 1742. Empress Elizabeth( 1837-1898) was the last resident of the building. The Amalia Residence was built in Renaissance architectural style with a small domed tower in the centre of the roof and a clock in front of it. 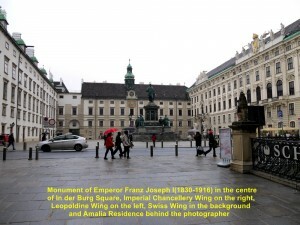 A building block in Baroque architectural style was built to connect Swiss Wing to Amalia Residence by Emperor Leopold I in 1668-1680 and named after the emperor, Leopoldine Wing(Leopoldinischer Trakt). 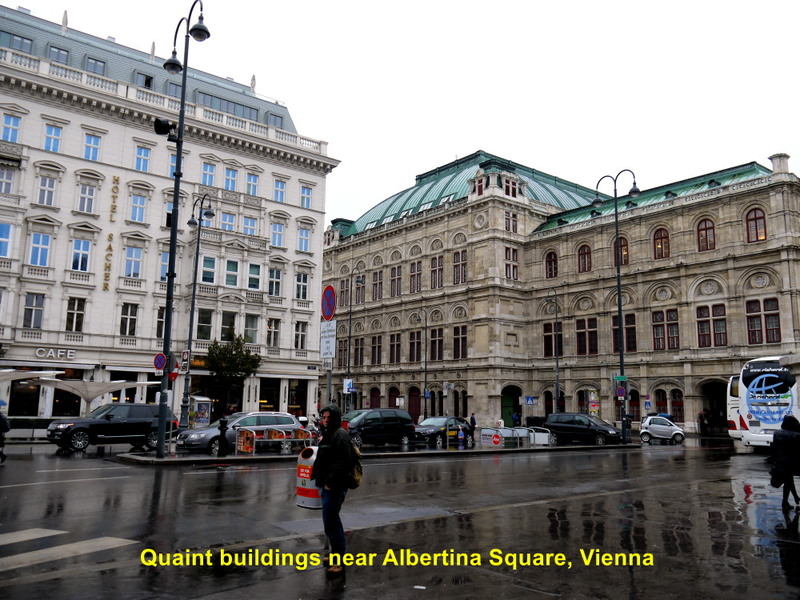 Empress Maria Theresa(1717-1780) lived in the building in the 18th. Century. After her death her rooms became state rooms. Now the building houses the Austrian Federal President’s office. 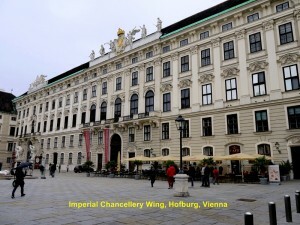 Facing Leopoldine Wing is another building block known as Imperial Chancellery Wing completed in 1730. 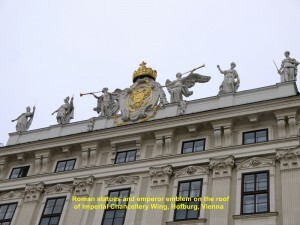 It housed the Holy Roman Empire Chancellery until 1806. 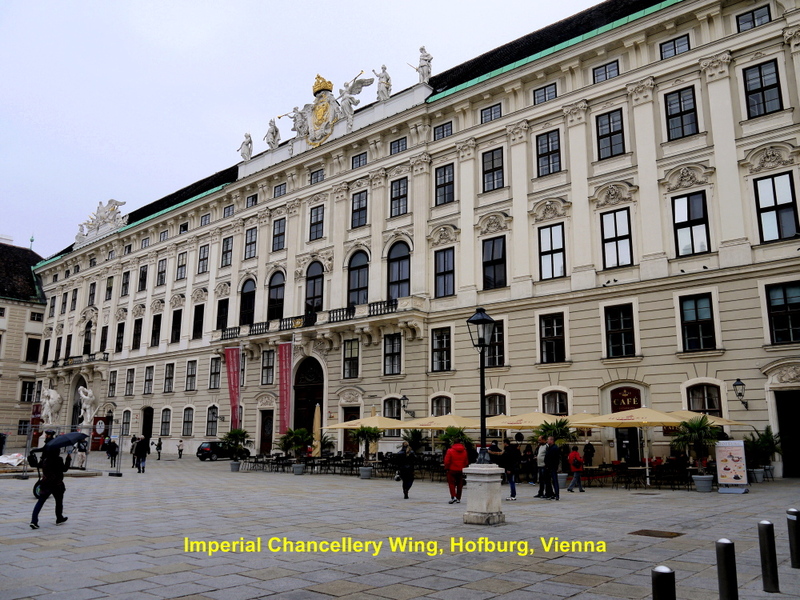 Then it became residential suites for the imperial family and Emperor Franz Joseph I(1830-1916). In the centre of In der Burg Square is a monument with a statue of a Roman Dictator, Julius Caesar(100-44 B.C. 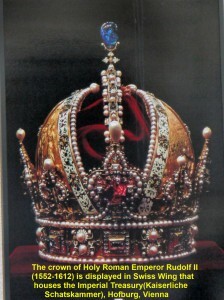 ), standing at its top. 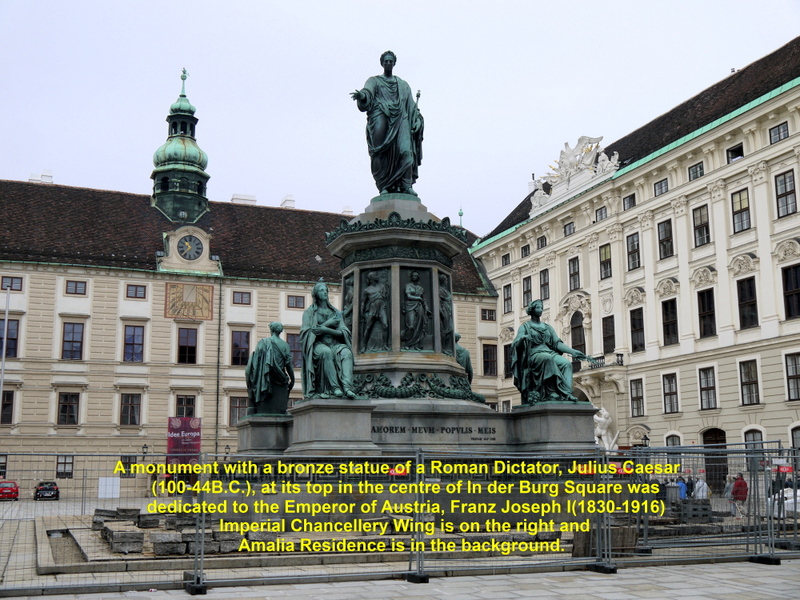 It was erected there in memory of Emperor Franz Joseph I(1830-1916). 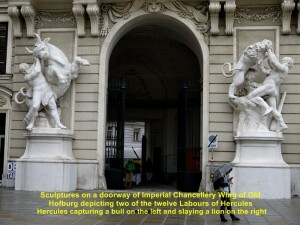 On the two doorways of Amalia Residence(Amalienburg) are four sculptures depicting the Labours of Hercules, including the capturing of a bull and slaying of a lion. 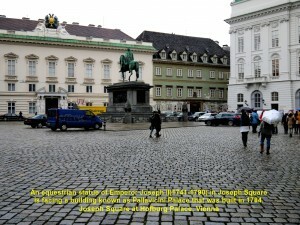 When we left In der Burg Square we entered another courtyard known as Joseph Square. 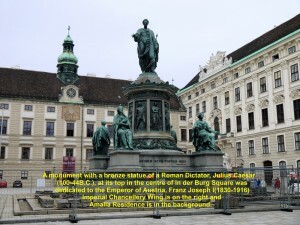 In this square a monument of an equestrian statue of Emperor Joseph II(1741-1790) was erected between 1795 and 1807 and the statue looks like a Roman conqueror. Behind the monument of Emperor Joseph II is a building block built in late Baroque architectural style in the 18th. Century. 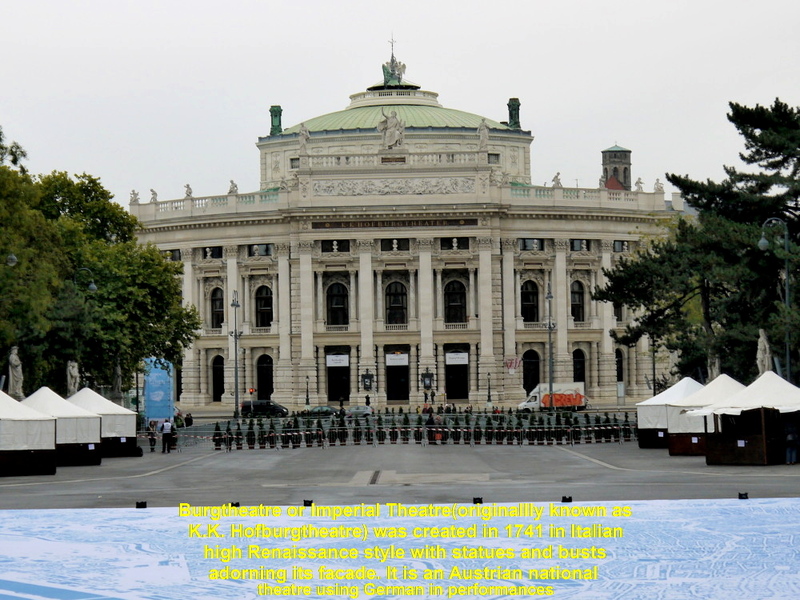 It was originally the Imperial Library, but now it houses the Austrian National Library, concert hall and State Hall(Prunksaal). 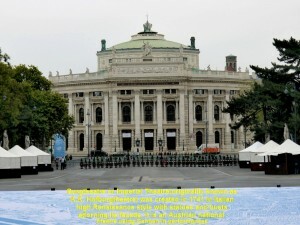 The monument is facing a building block known as Pallavicini Palace built in neo-classical architectural style in 1784. 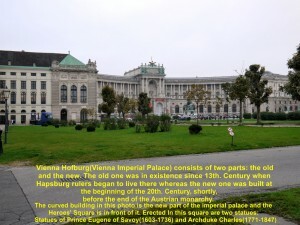 It was not part of the Imperial Palace(Hofburg). It is now owned by an Italian noble family, Pallavicni. Its main doorway is flanked by statues of Roman ladies. 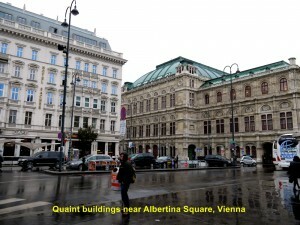 When we left Joseph Square we walked to Albertina Square nearby to wait for our coach. 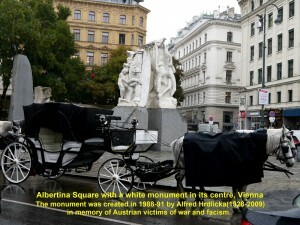 While waiting I noticed a white sculpture in the small square depicting war victims in grotesque positions and in pain. It is a monument in memory of victims of war and fascism in Austria. Alfred Hrdlicka(1928-2009), an Austrian sculptor, created it in 1988-91. There are several quaint buildings built in Baroque architectural style near the square. 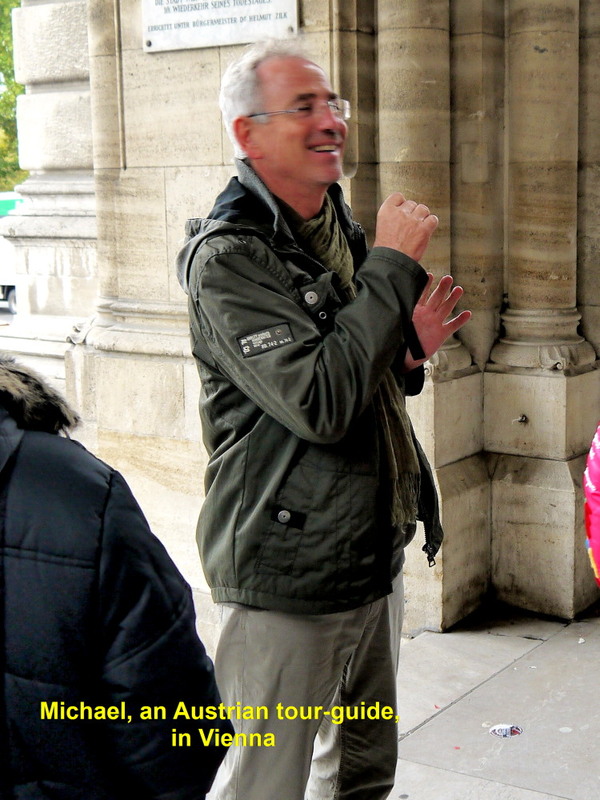 Then our coach arrived and brought us to another palace known as Belvedere, an 18th. 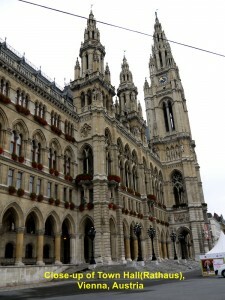 Century palace built in Baroque architectural style. It is about 2.2 km south-east of Hofburg Palace.